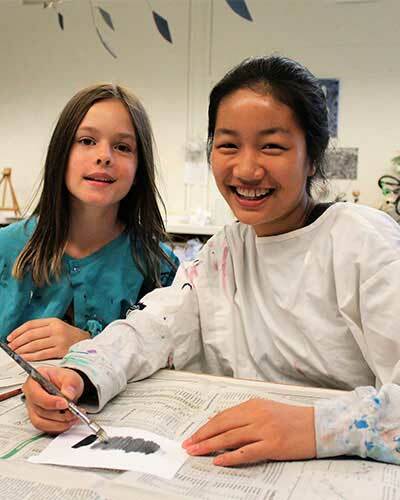 The Overlake School’s world language program is designed to broaden students’ understanding and appreciation for the diversity of world cultures by building linguistic and cultural competence through the study of language. 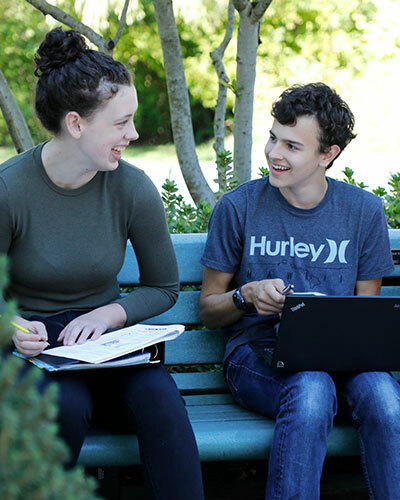 Overlake offers a variety of choices for students wishing to study modern languages or the classical language of Latin. In the modern languages, emphasis is placed on building oral proficiency and practical skills in the target language. All modern language classes include a strong cultural focus, giving students the opportunity to reflect on their own cultures and beliefs while developing an enriched understanding of the world around them. 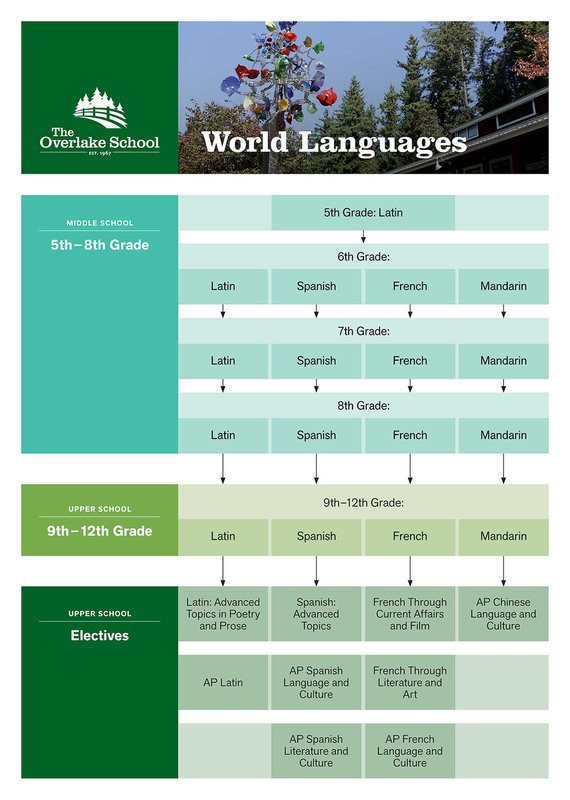 Overlake offers the modern languages of Spanish, French or Mandarin Chinese for new and continuing students. Our classical language, Latin, gives students the opportunity to experience an ancient culture that has had a major influence on our history and government, our culture and art, as well as our own vocabulary and language. Students are required to take three years of one language or two years each of two different languages during their Upper School career. Students who complete any Level IV are only required to take two years of Upper School language courses, however all students are encouraged to continue the study of a language beyond the third year to acquire competency in comprehension, speaking, reading and writing. All language courses are full year courses. Offering of any language course is contingent on a minimum number of student signups. French A is a first-year course for sixth grade students with little or no prior background in French. The course is designed as an introduction to the French language within the context of the contemporary francophone world and its cultures. While the course is aimed at bringing students to a basic level of proficiency in the areas of listening, speaking, writing and reading, its main emphasis is on early understanding and speaking using various commands, questions and simple statements to communicate at the novice level. Students develop a core vocabulary and a basic knowledge of the language necessary for communication in carefully structured situations, centered on themselves, their families and friends, their personal activities and their immediate environment. French B is for students who have completed French A. Students begin with a review of what they learned in French A and continue to build a basic level of proficiency in the four areas of the language, although oral proficiency in the language as it is spoken "in real life" is the main focus of the class. Students learn an extended vocabulary and new accurate patterns of verbal and written communication. Students continue to study about the cultures of France and other French-speaking countries. French C students begin with a review of French A and B, and continue to build more proficiency in the language. Speaking skills continue to receive major focus, but additional emphasis is placed on reading, writing, and listening comprehension. The primary text is supplemented by selected short stories, poems, cartoons, music, films, and online sources, helping students to develop a deeper understanding of the culture. Students prepare and present projects on some aspects of the culture of the French-speaking world. This course is designed for Upper School students who have little or no prior background in the language. It introduces students to the French language within the context of the contemporary French-speaking world and its cultures. While the course is aimed at bringing students to a novice level of proficiency in the four areas of language acquisition—listening, speaking, reading and writing, its main emphasis is on comprehension and speaking. Reading and writing are used to reinforce oral practice. Students develop a core vocabulary and knowledge of the basic skills necessary for communication. Students learn to speak about themselves, their families, friends and activities, and are introduced to culture through films, cultural videos, music and other authentic materials. Students prepare and present projects about some aspect of their lives. French II students continue to build more proficiency in the language developed in French I (or the MS French A and B series). The development of speaking skills receives major focus, but additional emphasis is placed on reading, writing, and listening comprehension. The primary text is supplemented by selected short stories, poems, cartoons, music, and films, and online sources to help students develop a deeper understanding of the cultures behind the French language. Students prepare and present projects on some aspects of the cultures of the French-speaking world. At this level students review and extend their knowledge of the French language and culture necessary for communication in a variety of situations. Although oral communication continues to be stressed, equal emphasis is now placed on improving listening and reading skills through in-class readings, and developing writing skills through compositions. Students are introduced to some works of modern Francophone literature through authentic excerpts, short stories and poetry, and/or the book Poursuite dans Paris by Nicolas Gerrier. The study of culture is based on a variety of authentic sources, such as magazine articles, films and the Internet. Students prepare and present a report on some aspects of the culture of the French-speaking world. This course is designed to help students improve their oral communication skills through prompted and guided conversations, debates, and interviews. Written communication skills are enhanced through intensive reading and the practice of compositions and reports. Students continue to be exposed to authentic sources, such as magazine articles, the Internet, films, and literary works, and prepare oral and written reports on some related topics to reach a deeper understanding of the culture of the Francophone world. Through the news, students are introduced to global issues that they further explore in class through discussions, presentations and through written reports. Students read the entire work of Antoine de Saint-Exupéry, Le Petit Prince, leading to philosophical discussions and profound analysis. This course is designed to help students build their language proficiency at an advanced level through a variety of cultural studies. There is continued emphasis on improving communication skills through practicing conversation, listening comprehension and more sophisticated writing. Through articles, TV news, and films, students engage with relevant topics such as the death penalty, euthanasia, terrorism and with politics, economics, and lifestyle. They discuss their ideas and opinions in class and make cross-cultural comparisons between the laws in France and in the United-States. Students also learn about the educational system in France and Europe. These authentic sources provide the opportunity for cultural reflection through the use of the French language. This course is designed for students who have completed French through Current Affairs and Film and/or AP French Language and Culture. It allows all interested students to complete a fourth year of studies in advanced French. The course is organized around major works by French philosophers, novelists, playwrights, poets and/or cartoonists as well as around major art work by French painters, sculptors, photographers, designers, musicians and/or movie directors. The students focus on refining listening and reading comprehension, along with oral and written communication skills. The students reinforce their fluency in oral discourse, strengthen their ability to communicate through persuasive written expression, improve impromptu speaking capabilities, and attain a richer understanding of the culture of Francophone countries. The class material is varied and students prepare reports, write essays and poems, engage in oral conversation, and make presentations and short films. This is a full-year course designed to give students a basic introduction to studying a world language and to the principles of language in general. Using the Minimus text, students will learn the basic patterns of language through rudimentary Latin grammar and Greek and Latin vocabulary. All language study will focus on parallels with English grammar as well as English and Romance Language derivatives. Individual and group projects will complement the students' experience of the language and culture. Moreover, the course exposes students to the wealth of Greek and Latin culture, with an emphasis on cross-cultural interaction and on the influence of these cultures on our own. The first level of middle school Latin introduces sixth grade students to the language, culture and history of the ancient Romans. The students will develop reading and writing skills in Latin and language skills in general, including grammar, vocabulary, derivation and word study. First-year Latin students learn basic and vital grammar, including being able to identify and use correctly basic declensions of nouns and adjectives, as well as indicative tenses of regular and irregular verbs. Readings are based on fictional characters and their lives in and near ancient Rome. Additional material covers etymology, history, culture and mythology. Latin A students also participate in the National Latin Exam. In Latin B, students continue to build on their knowledge of the Latin language and the Roman people. They continue their study of grammar and learn the remaining noun declensions as well as more detail on tenses in the active voice and indicative mood for regular and irregular verbs. They continue to develop skills in etymology, vocabulary, and reading as they prepare to enter intermediate Latin in the upper school. The readings are a continuance of the Latin A stories. Students explore the history, culture, and mythology of the Romans more deeply. Our seventh-grade students also participate in the National Latin Exam. In Latin C, students continue to build on their knowledge of the Latin language and the Roman people. They begin to study more advanced concepts in Latin grammar and continue developing skills in vocabulary and etymology. They continue to develop reading skills as they prepare to make the transition from adapted Latin to original texts. The students will complete this course with a confidence in translating Latin – single sentences as well as extended passages. They will be able to recognize Latin roots, prefixes, and suffixes in English words and thereby enrich their knowledge of their native tongue. Our eighth-grade students also participate in the National Latin Exam. The first year of Latin introduces students to the Latin language and the culture and history of the ancient Romans. Students will develop reading and writing skills in Latin and language skills in general, including grammar, vocabulary, derivation, and word study. They are expected to master the basic and vital grammar needed to read the Latin the first year student will encounter. This includes being able to identify and use correctly the declensions of nouns, adjectives, and all indicative tenses of regular and irregular verbs. Readings are based on fictional characters and their lives in and near ancient Rome. Additional material covers etymology, history, culture, and mythology. Students in Latin I also participate in the National Latin Exam. In the second year of Latin, students continue to build on their knowledge of the language and the Roman people started in Latin I (or the MS Latin A and B series). They complete the study of Latin grammar and continue developing skills in vocabulary and etymology. Students continue to develop their reading skills in preparation for the transition from adapted Latin to original texts. The students will complete this course with a confidence in translating both single sentences and extended passages of Latin. They will be able to recognize Latin roots, prefixes, and suffixes in English words and thereby enrich their knowledge of their native tongue. Students in Latin II participate in the National Latin Exam. This course continues from the study of Latin II (or MS Latin C), emphasizing reading and translation skills. The class begins by completing the advanced grammar concepts needed for reading authentic Latin texts. Initial readings focus on helping students make the transition to reading authentic Latin texts by introducing them to Latin prose and poetry in a graded format. Creative projects accompany the authors to give students a chance to enhance their experience of the reading. Throughout the course, grammar is reviewed through special activities that supplement the reading. Students also explore the daily life and history of Rome through original, literary sources. Etymology work is constantly emphasized as the students continue to strengthen their English vocabulary. Latin III students participate in the National Latin Exam. This advanced course of Latin emphasizes reading, translating, and composing skills. Students will have an opportunity to read various ancient texts. In the past, such texts have included Livy's Ab Urbe Condita, Apuleius’ Cupid and Psyche, and Ovid’s Metamorphoses. Students will prepare independent, creative projects to complement and enhance their reading of the authors, although grammar analysis, vocabulary, composition, etymology, and translation are the core elements of the class. Students in Latin IV participate in the National Latin Exam. After Latin IV, students have a choice of going on to AP Latin, Advanced Topics: Prose, or Advanced Topics: Poetry. In this course, students expand their experience of the language by exploring new genres and areas of study in Latin. Latin V students pursue further development and refinement of poetic devices, meter, morphology, vocabulary, and syntax through the reading of the original texts of significant Latin prose authors or poets, based on student interest. Past authors have included Cicero, Tibullus, Sallust, and Catullus, as well as medieval texts. Students will gain a deeper understanding of Roman history, culture, and literature through our exploration of these texts. Moreover, the basic principles of studying ancient art, archaeology, music, epigraphy, and paleography are introduced through our reading of the texts and through periodic presentations and projects. In this course, students learn the basic principles of how languages change over time. As Latin was the basis for the field of linguistics, students can apply their knowledge of Latin to gain basic insights into the origins of the Romance languages. Ostler’s Empires of the Word, and Deutscher’s The Unfolding of Language will help students develop their understanding of how Latin evolved into entirely new languages, and how to identify cognates and derivatives that may not be readily apparent. Through a study of historical language change, students will gain new perspective on their own language and its role in world history. In this course, students will build on their knowledge of Latin grammar to gain an appreciation of other Classical languages, specifically Ancient Greek and Old English. Students will learn their alphabets and sounds, and discover the connections between Latin and other ancient languages descended from a common Indo-European ancestor. Via creative projects and presentations, students will study the culture of the ancient world that existed beyond Rome’s borders. Readings in translation, side-by-side with the original languages, will help students build confidence that they can use their knowledge of Latin as a tool for learning other languages in college and beyond. Mandarin Chinese A is for sixth grade students who have little or no prior background in the language. Mandarin Chinese A introduces students to the standard Chinese language (Mandarin) and culture. Emphasis will be placed on pinyin (the phonetic system indicating Chinese pronunciation in the English alphabet), listening comprehension and speaking skills. Simplified Chinese characters will be taught during the course, while traditional forms of characters are also introduced. Students will develop a core vocabulary and knowledge of basic grammar for conversation. Conversation topics will relate to daily life and school life, such as greetings, personal hobbies, and courtesy expressions. Cultural knowledge is gained through videos, arts and crafts, and supplementary readings. Mandarin Chinese B is for students who have completed Mandarin Chinese A. At the beginning of the course, students will have a short review of what they learned in Mandarin Chinese A. Then they will continue to study language and culture more in depth. Emphasis will remain on listening comprehension and speaking skills. Simplified Chinese characters will be taught in this course. Students continue to practice writing characters while their typing skills improve in terms of speed and accuracy. Students will also develop a core vocabulary and knowledge of basic grammar for reading and writing. Mandarin Chinese C starts with a short review of Mandarin Chinese A and B, and continues to expand students' communicative abilities. Speaking and listening remain as the focus, while reading comprehension and writing are also emphasized. Accurate pronunciation and intonation are stressed. Conversation topics relate to situations that could occur while studying abroad; such as shopping, renting houses, banking, and travelling. Students are also expected to become more proficient in both handwritten and word-processed Chinese writing by using the pinyin input method. Further cultural knowledge is gained through supplementary readings, movies, research projects and cultural activities. Mandarin Chinese I is for students who have little or no prior background in the language. Students are introduced to standard Chinese language (Mandarin) and culture. Emphasis is placed on pinyin (the phonetic system indicating Chinese pronunciation in the English alphabet), listening comprehension, speaking skills and character writing. Simplified Chinese characters are taught during the course, while traditional forms of characters are also introduced to show the formation and change of Chinese characters. Students develop a core vocabulary and knowledge of basic grammar for conversation. Conversation topics relate to daily life and school life; such as, greetings, directions, personal hobbies, and courtesy expressions. Cultural knowledge is gained through videos, movies, online research, and supplementary readings. Mandarin Chinese II starts with a short review of Mandarin Chinese I (or the MS Mandarin Chinese A and B series) and continues to expand students’ communicative abilities. Speaking and listening remain as the focus, while reading comprehension and writing are also emphasized. Accurate pronunciation and intonation is stressed. Conversation topics relate to situations that could occur while studying abroad; such as shopping, renting houses, banking, and travelling. Students are also expected to become more proficient in both handwritten and word-processed Chinese writing by using the pinyin input method. Students improve their writing through letter replies in simulated and real situations. Further cultural knowledge is gained through supplementary readings, movies, research projects and cultural activities. Mandarin Chinese III begins with a short review of Mandarin Chinese II (or MS Mandarin Chinese C) and continues to build up the four language skills of reading, writing, speaking and listening. Speaking and listening skills continue to be the major focus, while additional emphasis is placed on reading comprehension and writing short essays. Conversation topics relate to cultural comparisons and personal opinions. Students learn to talk about their school life with ease. Students also have chances to practice speaking with other native speakers. They improve their writing skills through replying to emails and writing summaries of their reading in Chinese. Further cultural knowledge is gained through supplementary reading in Chinese, contemporary Chinese movies, pop songs, and short stories. Mandrin Chinese IV begins with a short review of Mandarin Chinese III and continues to build up the four language skills of reading, writing, speaking and listening. Students continue to strengthen their speaking and listening skills, while simultaneously focusing on improving reading comprehension and writing skills. Conversation topics are similar to Mandarin Chinese III, but with expanded vocabulary use. Students learn to express their personal opinions on everyday topics with ease, with themes such as friends, school, sports, movies, and music. Students learn about culture through extensive reading in Chinese. They improve their writing skills through short essays, replying to emails from their pen pal in China and by writing short stories in Chinese from provided picture prompts. Students develop a further appreciation for the language and culture by reading in Chinese from authentic sources, such as magazine and newspaper articles, the Internet, contemporary Chinese movies and by learning current pop songs. Mandarin IV serves as additional skill-building for students interested in continuing to the AP level. Mandarin Chinese V will begin with a review of Mandarin Chinese IV, and then will continue developing students’ communication skills through more complex grammatical concepts and extended vocabulary. Oral and listening skills will remain the main focus of learning, but additional emphasis will be placed on understanding culture, reading comprehension, and essay writing. Further cultural knowledge will be gained through class activities, discussions, websites, films, videos, songs, poems, short stories, and a variety of other authentic sources. Spanish A is for sixth grade students with little or no prior background in Spanish. This course introduces students to the Spanish language and the culture of the Spanish-speaking world. While the course is aimed at bringing students to a basic level of proficiency in the areas of listening, speaking, writing and reading, its main emphasis is on early understanding and speaking using various commands, questions and simple statements to communicate at the novice level. Students develop a core vocabulary and a basic knowledge of the language necessary for communication in carefully structured situations, centered on themselves, their families and friends, their personal activities and their immediate environment. Spanish B is for students who have completed Spanish A. Students begin with a review of what they learned in Spanish A and continue to build a basic level of proficiency in the four areas of the language, although oral proficiency in the language as it is spoken "in real life" is the main focus of the class. Students learn an extended vocabulary and new accurate patterns of verbal and written communication. Students continue to study about the cultures of the Spanish-speaking world through more complex assignments and collaborative projects. Spanish C students begin with a review of Spanish A and B, and continue building proficiency in the language. Speaking skills continue to be a major focus, but additional emphasis is placed on reading, writing, and listening comprehension. The primary text is supplemented by selected short stories, poems, songs, conversational scenarios and films, helping students to develop a deeper understanding of the culture. Students prepare and present projects on some aspects of the culture of the Spanish-speaking world. This course is designed for Upper School students who have little or no prior background in the language, introducing students to the Spanish language and to the culture of the Spanish-speaking world. Emphasis is placed on comprehension and speaking. Reading and writing are used to reinforce oral practice. Students develop a core vocabulary and knowledge of basic grammar necessary for communication. Students learn to speak of themselves, their families, friends and activities, and are introduced to the culture through films, cultural videos, music, scenarios and class discussions. Students prepare and present projects about some aspect of their lives. Spanish II begins with a review of Spanish I (or the MS A and B series) and continues building proficiency in the language. Speaking skills remain a major focus, but additional emphasis is placed on reading, writing, and listening comprehension. The primary text is supplemented by selected short stories, poems, songs, conversational scenarios and films, helping students to develop a deeper understanding of the culture of various Spanish-speaking countries. Students prepare and present projects on some aspects of the culture of the Spanish-speaking world. At this level students review and continue to extend their knowledge of the Spanish language and culture necessary for communication in a variety of situations. Although oral communication continues to be stressed, equal emphasis is now placed on improving listening and reading skills through in-class readings, and developing writing skills through guided compositions. Students are introduced to works of modern Hispanic literature through authentic excerpts, adapted texts, short stories and poetry and short films. The study of culture is based on a variety of authentic sources, such as magazine articles, films, the internet and current music. Students prepare a project involving one aspect of Spanish-speaking culture. This course is designed to help students improve their oral communication skills through the practice of guided conversation and oral reports, as well as to enhance their written communication through developing formal and informal writing. Students focus on improving listening and reading comprehension through exposure to authentic sources, such as magazine and newspaper articles, the Internet, current music and film. Reading selections include short stories, poetry and excerpts from prominent Spanish speaking authors. Grammar is reinforced in the context of these authentic readings. Special effort is made to enhance vocabulary knowledge through exposure to thematic units containing more sophisticated vocabulary. Students also reach a deeper understanding of the culture and current history of the Spanish-speaking world through more in-depth study of literature and film. Students work on two larger projects relating to their lives and several aspects of the Hispanic culture. Spanish IV serves as additional skill-building for those students interested in continuing the study of Spanish at the AP level in the future. Students have their choice of enrolling at the AP level, either AP Spanish Language or AP Spanish Literature, (with instructor permission) after successfully completing this course. This course is designed as an option for students who do not enter one of the AP courses to continue to build language proficiency at an advanced level after Spanish IV. In Advanced Topics, students expand their language skills by exploring in greater depth new genres and areas of study in the Spanish language. There is continued emphasis on improving communication skills through enhanced conversation and listening comprehension with authentic source materials. These authentic sources also provide the opportunity for cultural reflection through the use of the Spanish language.